On October 8, 2016 the Lake Erie water temperature (degrees F) off Toledo was 65, off Cleveland was 69, off Erie was 67, and off Buffalo was 67. Total steelhead stocking in 2015 was 1.790 million which is a 5% decrease from 2014 (NY’s 2015 stocking reduction had impact on total/see NY Region below). Ontario’s 2015 stocking was a 24% increase from 2014. Average mean length of yearling steelhead (smolts) stocked by Lake Erie stocking agencies in 2015 was 179 mm. MI averaged 193 mm, PA averaged 185 mm, OH averaged 181 mm and NY had the smallest average size at 124 mm. Lake Erie brown trout stocking was up 3% from 2014 with a total 141,013 brownies stocked by NY and PA.
A study released in January of 2016 (and headed by the University of Michigan) concluded that if bighead and silver carp took a foothold in Lake Erie (migrating from the Mississippi river), they literally could take over the lake ecosystem and make up 34 percent of the total fish weight in the Lake. This imbalance would greatly affect sport fish populations like walleye and steelhead. To help curtail this migration, an earthen berm was completed (May of 2016) at the Eagle Marsh Nature preserve in Fort Wayne, IN by the U.S. Army Corps. of Engineers (USACE) and the U.S. Department of Agriculture’s Natural Resources Conservation Service (NRCS). The berm will prevent Asian carp from moving between the Wabash River in IN and the Lake Erie watershed in OH (through the Maumee River). The Asian Carp Regional Coordinating Committee (ARCC) and the Ohio Department of Natural Resources are presently developing closure plans for two other water pathways into Lake Erie (considered medium risk) including Little Killbuck Creek and the Ohio-Erie Canal. A major water route that Asian carp could use to get into the Great Lakes is the Chicago Area Waterway System (CAWS). The USACE has built an electrical dispersal barrier at Romeoville, IL to prevent carp movement through the CAWS and into Lake Michigan which lawmakers, conservation groups and sport fish organizations say is insufficient. The USACE says it needs another four years to study all options to prevent carp movement through the CAWS. Many believe that the best solution would be to create a hydrological separation between the two drainage basins by closing the Chicago Sanitary & Ship Canal. The USACE estimates a basin separation (which was one of their proposals in a 2014 congressional report) could now entail costs of $18 billion or more. Wounding rates on lake trout (the traditional measure of estimated sea lamprey populations in Lake Erie), and lake wide estimates of adult sea lamprey populations, still indicate the continuing presence of a large sea lamprey population in Lake Erie (which is above acceptable target levels). Sea lampreys can have a negative effect on steelhead, brown trout and other Lake Erie fish species such as lake trout, walleye, whitefish, chub and herring. A parasitic phase sea lamprey can destroy up to 40 lbs of fish during its lifetime. Six out of seven fish attacked by sea lampreys die. -Barrier control projects on Big Otter Creek, ON (Black Bridge Dam), Grand River, OH (Harpersfield Dam) and Cattaraugus Creek, NY (Springville Dam). -Lampricide (TFM) application on Grand River (OH), Canadaway and Cattaraugus Creeks (NY), Crooked Creek (PA) and the main stem of Catfish Creek (ON). -Larval assessments on 54 streams (34 U.S. and 20 Canada) including the St. Clair River. -Study of the production potential for sea lampreys upstream from critical barriers by sampling habitat and native lamprey populations as a surrogate for Lake Erie sea lampreys. A status report concerning the Harpersfield Dam (Grand River, OH) lamprey barrier project was released in February 2016 by The U.S. Army Corps. of Engineers (USACE). The report says the federally funded feasibility phase of the project has been completed with the project partnership agreement being negotiated and signed by all parties during the summer of 2016. Engineering and design work for the project should be completed by January 2017, with construction projected to be completed in November 2018. Engineering, design and construction costs are now estimated to be $6.5 million. The importance of this barrier on the deteriorating Harpersfield Dam is to prevent lamprey passage and reproduction upstream of the dam. This will eliminate the need for costly lampricide treatments ($335,000 per treatment), help lower the overall sea lamprey population in Lake Erie and eliminate lampricide application which can be lethal to some non-target species in the Grand River watershed. The Pennsylvania Fish & Boat Commission (PF&BC), in January of 2016, purchased 3 public fishing easements and one property acquisition along Elk Creek in Erie County PA using funds from the PF&BC’s Lake Erie Access Improvement Program (LEAIP). The LEAIP is funded by the PF&BC’s Lake Erie Fishing Permit Program (and matching funds). -Two easements (1,175 and 870 linear ft.), located off of Elk Valley Road and downstream of Fairview Township’s Struchen Flats property. The addition of these easements creates a 1 mile corridor of connected public access. -One easement (410 linear ft.), located off of Rick Road and upstream of the PF&BC’s Rick Rd. access. -Approximately 1,600 linear ft. of frontage on 8 acres of land (property acquisition) immediately west of Interstate 79 and at the end of Skinner Rd. near McKean, PA. The PF&BC continued its adult spawning steelhead study in 2015 (which began in 2010). The study over the years has shown a decline in mean length (over 60 mm) for adult steelhead, with this decline more pronounced in males. Average mean length for adult steelhead in the study (2010-2015) is 580 mm. 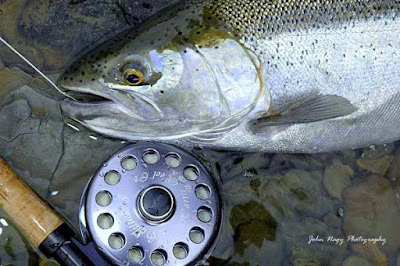 The PF&BC believes an increase in male “jacks” (immature returning steelhead) in spawning runs since 2010 and increased juvenile stocking size (which influences jack numbers) has impacted this decrease in mean length. The study has also shown a decline in mean length of spawning run adult steelhead since 2010. The PF&BC is not sure why this decline is occurring. Steelhead wounding rate data collected during the study showed high wound rates in 2009-2010 which corresponded to a decline in the steelhead sample size (population) for those years. Interestingly steelhead wound rates have decreased in the study since 2010. A non-disease related mortality event at the Salmon River State Fish Hatchery in 2015 resulted in a substantial reduction of steelhead stocked in NY’s Lake Erie tributaries in 2015 (only 120,000 yearling Washington Strain steelhead were available from the Salmon River hatchery). Total 2015 NYDEC steelhead stocking (153,923) was down 41% versus 2014. The NYDEC yearly Lake Erie target stocking is 255,000 steelhead. To supplement the 120,000 Salmon River hatchery steelhead (59,145 of these were stocked in Chautauqua Creek to maintain an ongoing research project on stocked steelhead emigration) surplus steelhead were obtained from the states of Vermont and Pennsylvania. These included 28,400 yearlings and 32,000 spring fingerlings (Magog and Washington Strain) from Vermont (and stocked in Eighteen Mile Creek) and 30,000 Lake Erie Strain fall fingerlings from Pennsylvania (and stocked in Cattaraugus Creek). The NYDEC changed their steelhead stocking policy on the Lake Erie tributaries in 2015. Steelhead are now stocked closer to the stream mouths (versus upstream in the watershed). This change was made due to the reduced number of fish available for stocking in 2015 and emerging results of the NYDEC Chautauqua Creek steelhead emigration study which showed that many upstream stocked steelhead were not smolting (due to their small size) and not emigrating out of the stream to Lake Erie. The NYDEC Chautauqua Creek steelhead smolt emigration study will continue for a few more years and gather data to determine the best combination of stocking location and juvenile size for smolt survival and out-migration to the lake (with the goal of improving adult returns). Steelhead stocked into Chautauqua Creek in 2015 were marked with combination fin-clips and coded wire tags for this study. The NYDEC has released a draft of a 10 year Steelhead Lake Erie Management Plan. The plan had a public comment period up to August 1, 2016. -Determine a realistic stocking size and stocking strategy to maximize adult returns (see Chautauqua Creek study above). -Maintain average steelhead catch rates of 0.33 fish/hour or 1 fish per 3 hours of fishing (A 2014-15 NYDEC angler survey found NY tributary catch rates of .32 fish/ hour which is much higher than many Great Lakes and West Coast tributary steelhead fisheries). -Encourage production of wild steelhead in areas with suitable water quality and habitat (68% of NYDEC surveyed anglers relayed that catching wild steelhead was important to their fishing trip). -Increase stream access (including adding 5 additional angler parking areas and increase Public Fishing Rights (PFR) easements by at least 0.5 miles by 2025). -Protect existing habitat (including supporting 5 habitat projects by 2025). -Continue and improve steelhead fishery evaluation (including spring/fall adult spawning surveys and monitoring a trap and sort weir for the proposed Springville Dam fish passage project). A draft of the Project Partnership Agreement for the Springville Dam Ecosystem Restoration Project on Cattaraugus Creek, NY is being reviewed by the non-federal sponsors of the project. Upon completion of the review, the USACE will finalize the draft for signature by all parties. Erie County, NY in 2016 has committed $470,000 toward the non-federal cost share of the project. Some of the fishery information and data for this 2016 Fall Steelhead Report was referenced from The 2016 Great Lakes Fishery Commission/ Lake Erie Coldwater Task Group Report and the 2016 NYDEC Lake Erie Annual Report. Special thanks also goes to Kevin Kayle, Chuck Murray and Jim Markham, Lake Erie fishery biologist’s (of OH, PA and NY respectively), who helped with this (and past) John Nagy Steelheader's Journal steelhead reports.